A significant attraction not limited to the municipality but the region itself is the roman-catholic church of St Peter and Paul. Its first written mention dates back to 1253 and according to the tradition it was built based on the rule of king Stephen I in the effort to establish Christianity in his kingdom ruling: “ten villages must build a church”. It’s architecture preserved the signs of late Romanesque and Gothic style and due to a major reconstruction during Renaissance this style can be observed too. The church itself stands out with two towers making it unique in the closer and wider region. On the really same square you can find an oak tree old hundreds of years. 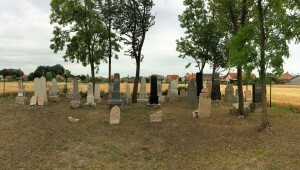 Showing the significance of our history is the Jewish cemetery – renovated and re-opened for public visitors in June 2016. The history of Jews in the region dates back to the 18th century and the first written mention of a Jewish family living in our village dates back to 1710. 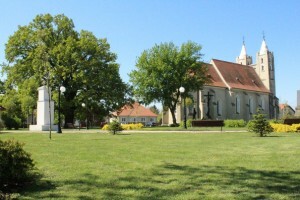 The cemetery was founded in 1884. Until the Jewish community has not grown enough, they used to visit the synagogue and other religious facilities in Dunajská Streda (Hungarian: Dunaszerdahely) – a town 11 km’s away. In interesting fact is that Maximilan Mentzer the father of Estée Lauder (the co-founder of the eponymous cosmetics company) declared to come from Holice (Gelle) before immigrating to the United States in 1890’s. The name Estée (originally pronounced as ‘Estee’) comes from the nickname ‘Eszti’ (after Hungarian Eszter). Our municipality is a home to a number of events. The ones with major significance are the memorial day to the victims of the Hungarian revolution in 1848 and 1849 (celebrated 15 March) that is followed by an art exhibition of authors from the region. For a number of years the summertime started by international workshops of painters and other artists – under the name Message Art – an initiative by painter Sandor Godany. Every beginning of August is marked by a gathering called ‘days of the village’ where we come together to remember our ancestors, history and culture followed by a feast and concerts. There are two significant events in autumn: a festival to celebrate folklore and our traditions called ‘Kondoros‘; and another event dedicated to traditional Hungarian “nóta“ which is song style back from the 19th century.